The UK solar power specialist Photonic Universe Ltd is proud to offer this brand new, high efficiency 275W polycrystalline solar panel, manufactured in Germany to the highest European quality and performance standards. No-quibble 30 days return period. Free lifetime technical product support. Deep industry expertise and knowledge. This high efficiency, waterproof 275W polycrystalline solar panel is perfect for all off-grid installations on caravans, campervans, motorhomes and boats; for charging leisure battery banks or for standalone off-grid household solar systems with batteries. It can also be used for off-grid lighting applications and for back up power systems with batteries and inverters. This solar panel features thick 4.0mm tempered solar glass, which makes it a lot stronger and more durable than other standard solar panels with 3.2mm glass. The panel is fitted with 2 x 0.9m cables specially designed for solar panels to carry high currents with negligible power loss (4mm cross section). The cable comes with waterproof MC4 connectors which can either be used for easy connectivity to your existing system, for linking several panels together or for connecting 4.0mm extension cable. Please note that this solar panel requires a 20A solar charge controller for charging batteries. For 12V batteries it requires a high efficiency 20A MPPT solar charge controller / regulator. For 24V batteries or battery banks, a standard 20A solar charge controller / regulator. May be used with this solar panel, although a high efficiency MPPT controller will have a stronger output and shorter charging time for your battery. To view the full range of solar charge controllers we offer, please visit the Solar Charge Controllers category of our online shop. Maximum power voltage: 31.36V. Maximum power current: 8.77A. Open circuit voltage: 38.57V. Short circuit current: 9.38A. Dimensions: 165.5 x 99.5 x 4 cm. Operating temperature range: -40C to +85C. Special tempered solar glass 4.0mm thick. 2 x 0.9m of high quality single core solar cable 4.0mm cross section. Male and female MC4 connectors. In order to mount this solar panel on a flat surface (such as a motorhome / caravan / campervan / boat or a metal roof) and avoid drilling, we recommend purchasing the following mounting products for fitting the panel to a roof: corner mounting brackets. Or a complete mounting set with corner brackets, side brackets and a cable gland. (tick the box "This is not about an item" if you don't know this item number). We accept Pay Pal, cheques, credit and debit cards, and bank transfer payments. Upon receipt of the item, please examine it carefully. To enable us to deal with the courier efficiently, we may ask for some additional details, e. Photographs of the damage and packaging. Please ensure that we receive the item in its brand new, original condition, i. Take reasonable care to wrap and protect it on the way back to us. In addition, the solar cells are guaranteed to produce at least 90% of nominal power in 10 years and 80% of nominal power in 25 years. Photonic Universe Ltd is a company based in London, United Kingdom. We design and supply solar and wind renewable energy products and complete off-grid power systems for various applications, to both trade and retail customers. Tens of thousands of clients all over the world rely on our products to generate clean energy for their households, vehicles, boats and remote places with no access to mains electricity. From our customers who have been impressed by the high quality of our products and excellent service. We are VAT registered in the UK and can provide VAT receipts upon request. 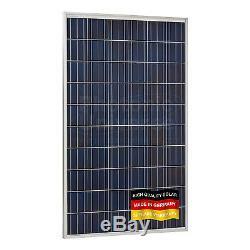 The item "275W solar panel for motorhome, camper, boat, off-grid power (made in Germany)" is in sale since Wednesday, August 2, 2017. This item is in the category "Home, Furniture & DIY\DIY Materials\Alternative & Solar Energy\Solar Panels". 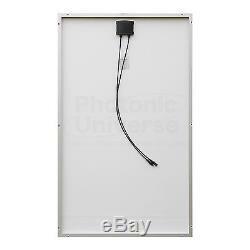 The seller is "photonic_universe" and is located in London. This item can be shipped to North, South, or Latin America, all countries in Europe, all countries in continental Asia, Australia.